While I actively check and work on this website, I have not written in a long time. Julien left us with a big hole in our hearts over 4 years ago. I still wake up reaching for him. I still cry, I still want him back, and I still live in the past. We do good work at the foundation, we help other families by supporting clinical trials. We have used our funds to help people get treatments that would otherwise be unavailable to them. Please help us to keep Juliens memory ALIVE and give children a fighting chance. The Julien Collot Foundation was formed in September 2007, in honor of my son who had previously undergone two bone marrow transplants. 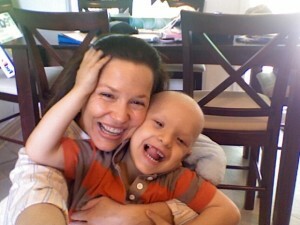 Our lives were turned upside down when on March 9, 2006 our 3-year-old son was diagnosed with AML leukemia. This is the adult-type leukemia that rarely affects children. Julien’s Foundation is a non-profit, IRS credited 501(c)3 charity. After living with this disease and suffering from the complications of treatments, we are determined more than ever to raise awareness, to fund research and trials for Pediatric Cancers and to assist families in need as they fight their formidable fight. Have you ever had to look someone in the eye who has been handed a death sentence? I certainly hope not, I can tell you first hand, that there is nothing more difficult in this world than trying to understand how this can happen. We are lucky, we are still here, still fighting, but so many of the people that we’ve met since Julien was diagnosed have lost their battles. We all know that this is unacceptable; and we are committed to do whatever we have to in order to help find a cure, to make a better world and to care for our future, our children. We support the Bone Marrow Transplant Research Team at Memorial Sloan Kettering Cancer Center in New York. We have seen what trials can do. Without the support of trials, some of these ‘treatments’ would not be available for many years. It was trial that saved my sons life after his second bone marrow transplant when he had serious problems with his liver. We have seen miracles first hand, and we need more. We thank you in advance for your cooperation in the matter.